Large panes of glass reveal the outdoor eating area. Gabriela’s has been around quite a while, opening with a splash on the Upper West Side on 1992 as part of the emerging, family-friendly, quality dining movement that was creeping through the neighborhood at the time (including Dock’s, Carmine’s and so forth). Gabriela’s was originally located on Amsterdam and 91st, but has long since transplanted itself to its current Columbus Avenue location. It seems to me that part of the reason for the move must’ve been for a larger footprint, so they can run their free pediatric care unit and kindergarten classes. At least, if they haven’t done those things yet, they should, because it is by far the most family-friendly restaurant on the Upper West Side. 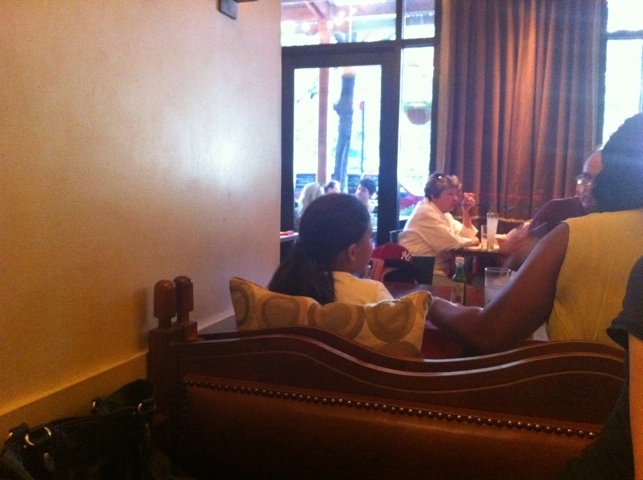 The restaurant is constantly swarming with children. What do I mean by “swarming?” During our most recent visit there, we counted no fewer than 13 children (including babies) spread out among the tables. If you want to see some Gabriela’s hosts get frustrated, tell them you’d like to sit somewhere away from children. If they do manage to find you a spot five feet further away from the most recent shrieker, not to worry: a child will be seated next to you in just a few minutes. 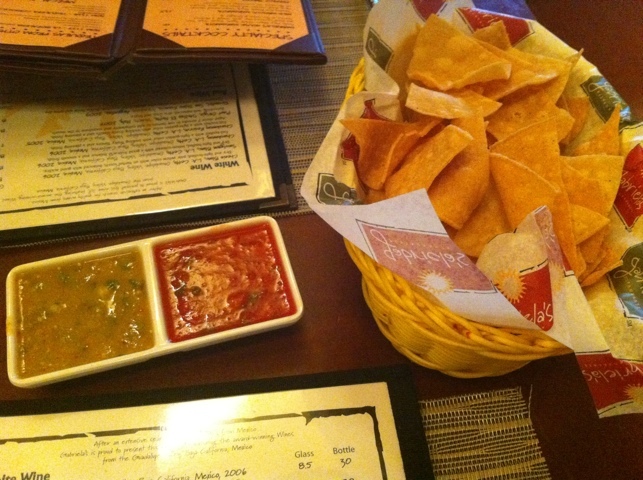 They get brought to the tables with the same customary regularity as the complementary chips and salsa. Gabriela’s has gone so far to stock its own large supply of lidded, bestrawed, plastic cups for children. They have a lot of them. During that most recent excursion, we saw something I’d not seen before. This time, one family had brought a portable DVD player and headphones and the kids, instead of shrieking and running and throwing and yowling, were instead watching some cartoon or another. Is this what it has come to? The architecture of Gabriela’s only amplifies the effect of the kids. 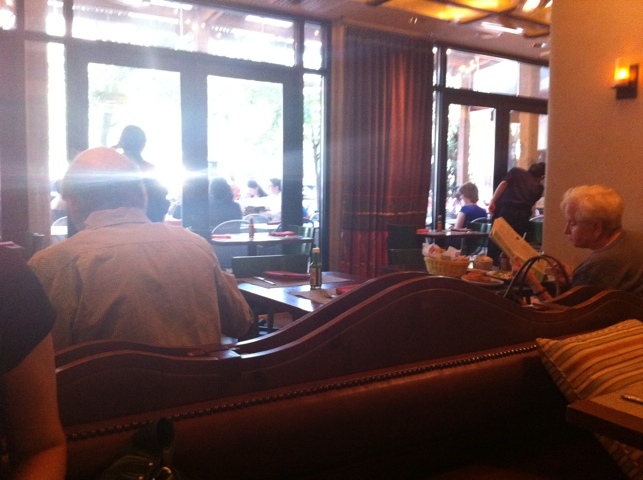 Inside the restaurant, there’s a wall of long, glass windows. There’s a lot of bare walls and columns. 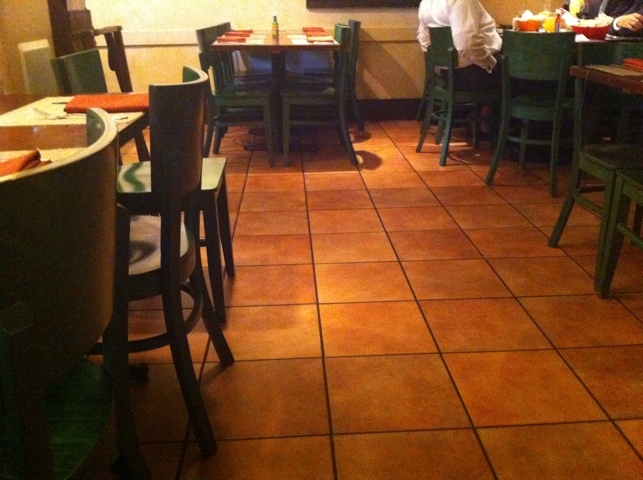 The floor I think is a significant factor: it is tiled. There is next to nothing to absorb some of the sound, so the crash, clank, clunk and shriek of the place is always maximized. To borrow from Spinal Tap: it goes to eleven. Why not hang some curtains along the bare walls to absorb at least some of the sound? Perhaps a rug? Part of the reason I’m making so much of the children thing is that the food is really quite tasty, but each time my wife and I go there, the volume of the place is such that it interferes with our enjoyment. It is not a place for a romantic dinner. But if you have children and are looking for a place where their antics will not spoil it for everyone else, since every other table also has kids at it, voila. The jalapeno slice foretells the heat... .
It’s also a damn good thing they serve so many tequila-infused drinks: margaritas, mojitos and more. The mojitos are sweet, sour and minty with a very thick flavor, almost like soda. 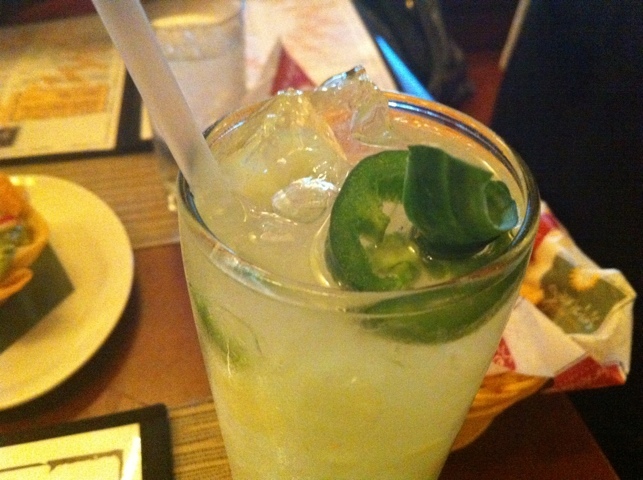 During a recent excursion I also savored a cucumber-jalapeno margarita, which again had a near-soda level of sweetness, but with some serious heat. Three narrow fish tacos. Not loaded with stuff, but tasty... .
By the way, how’s the food? I am pleased to say that generally it is delicious. Their seafood is very fresh, their specials are routinely worth trying, and their standard menu offers upscale versions of comfort Mexican classics. For example, their beef burrito is filled with brisket. It’s very decadent. Take their fish tacos: they are just silly and awesome. 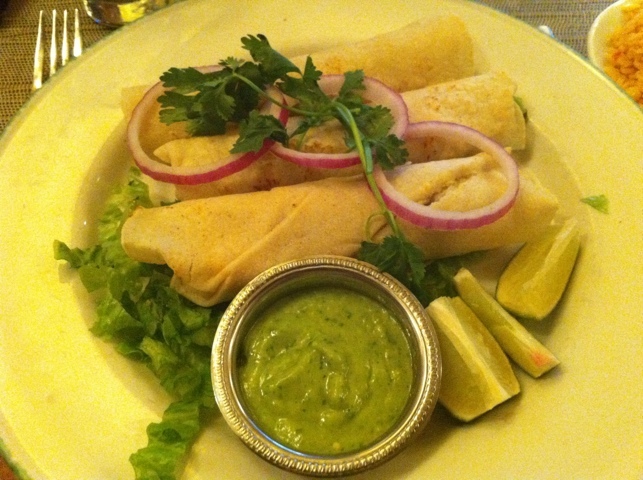 Three narrow corn tortillas wrapped around some deep-fried fish. Despite the frying, the fish remains nice and flaky and light and oh so rich. They pull off a neat trick of being hefty in flavor and light in actual portion size. The result? Satisfaction. Looks pretty. A bit on the small side, but... . 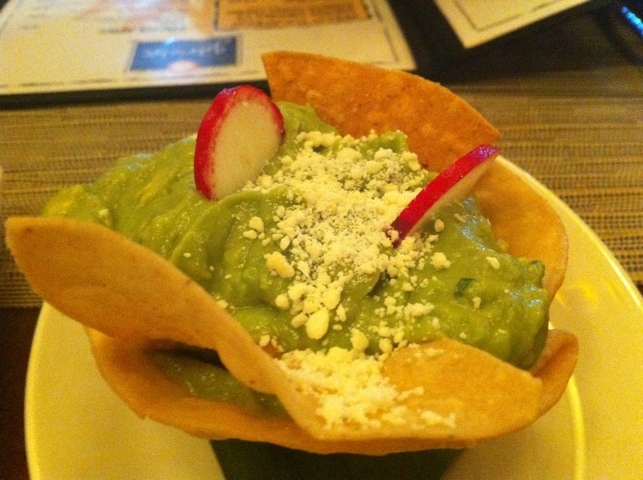 The guacamole is on the small side, creamy with hit-and-miss spiciness to it – that is to say, sometimes it is spicy, other times not. I think the slight dusting of Parmesan cheese atop it is inspired. It is served in a fried tortilla. My wife and I ate guacamole, two orders of the fish tacos and had three drinks for $72. I guess that’s another way in which the place is family-friendly: the price point. If you’re willing to weather the shrieks, screams, folly and disorder of the neighbor’s kids being kids, you’ll have a tasty meal. It’s not “authentic authentic” Mexican cuisine, it’s a bit gussied up, but the ingredients and flavors are dynamite. Just don’t be surprised if you find yourself wondering when the teacher is going to show up to talk to you about your child.